Is My Boy a Flame Point? 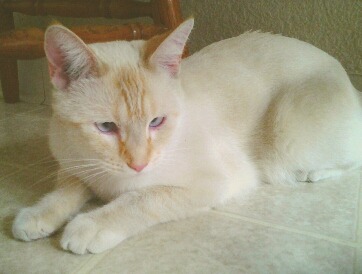 I wasn't even aware that there were such things as Flame point Siamese cats. I rescued my baby from my extremely irresponsible neighbors, who had two litters and didn't so much as feed them. I would feed mom (who by the way was a small grey, brown and white tortie) and her babies from both litters as soon as they were weaned, and set up a box on my porch with blankets in it for them to sleep in when it got colder. My baby (from her second litter) came to me one morning after my husband woke me up telling me he could hear a kitten crying in distress in their side yard. It had been mewing for a while and he didn't know what was wrong. I broke into their gate to find a tiny white kitten all alone, covered in used motor oil. It had fallen in a tub of it that they failed to dispose of. We took the kitten home to bathe it. All we had was Palmolive at the time and it wasn't working, so we went to get some Dawn and bathed him again. I stayed up all night worrying, with him on my chest, but he bounced back and was a normal kitten after a day or two. Then I started to notice that my little white kitty (we named him Boo because he was all white like a ghost) was turning orange in certain areas. I couldn't figure out why. He is also very cross-eyed. I'd never seen another cat like him. Then a friend I haven't seen in years came to visit last weekend. She tells me "you know your cat is Siamese?" but I didn't believe her. She said, "look it up" and sure enough, there he was! I don't know where the Siamese came from, or if he even is a Flame point (maybe he just looks like one) but he's unique and special not only because of his beautiful eyes and markings, but because of his personality. He likes to play hide 'n seek, comes running any time he hears the toilet seat, he's a brat, a goofball, a cuddler (on his terms now) and a one-person cat - mine! Robin, I loved your story, thank you! Boo is one very lucky kitten to have wound up living with you. He certainly looks like a Flame point Siamese (and a very handsome one at that!) I'd guess he got his red coloring from his tortie mom. It's difficult to know where his Siamese genes came from but with his blue eyes he's certainly got some somewhere. This color pattern seems to turn up fairly often in strays and abandoned kittens - we've had a few similar stories over the years - but I don't really know why. Comments for Is My Boy a Flame Point? Boo is doing great! The only problem we have ever had was him being anti-social and afraid of everything and everyone (except me). So a few months ago we decided that a playmate might help and adopted a Bengal kitten. She's great (I wish I was able to upload a picture, but can't) and has helped him to not be so scared and shy. He has taken to her well, they play like crazy, groom each other and cuddle all the time. He never took to our adult cats, so she's been really great for him, they're buddies! I was given a white kitten over a year ago. He started turning orange on the tips of tail and face. His personality was so intimate and unique! We became very close. Then this year March he was hit by a car. I was devastated and have been searching for another. This September I finally found one, and his personality mirrors my last ones'. Flame points are incredibly wonderful cats! Most likely a flame point. Ah, what a beautiful cat he is. He looks nearly identical to my kitten who recently got hit by a car. :( But yes, I would say he is a flame point.